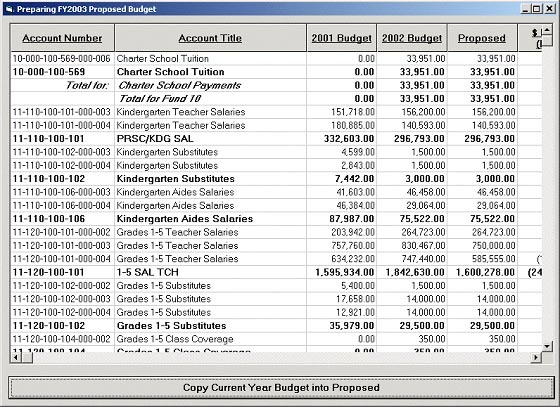 Packages > CDK For Windows Accounting PackageCDK RequisitioningCDK PersonnelCDK BudgetPrep Software | CDK Systems, Inc.
"CDK is incredibly responsive to the changing needs of school districts. They always seem to be one step ahead of everyone else." 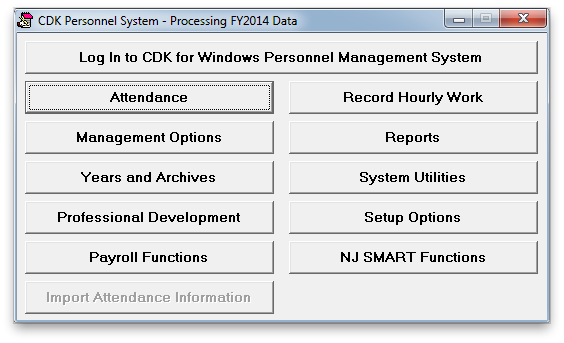 ​CDK for Windows is the sensible solution for meeting your district’s GAAP accounting needs. The program is extremely user-friendly yet powerful enough to keep you abreast of your financial status at all times. A few mouse clicks is all it takes to prepare your financials for a board meeting. The complete Board Secretary’s Report is produced from a single button on our reports menu. 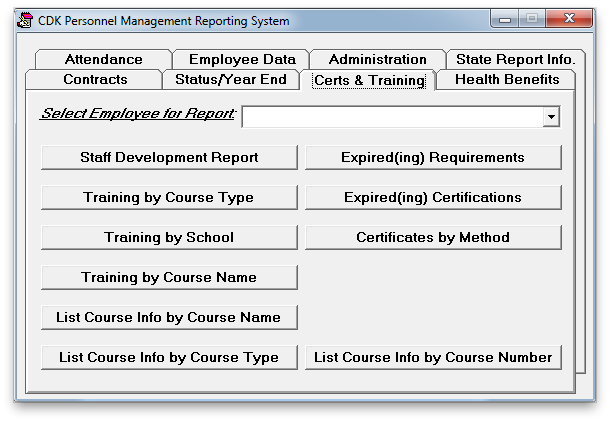 The software contans many helpful data analysis functions (such as our S1701 transfer analysis report), tracks various vendor certifications and includes complete invoicing/accounts receivable functions. Browse the screen shots and sample reports and/or call us for a free, on-site software demonstration. The Main Menu is the starting point in the program from which each user can log in and then, depending on the permissions assigned to that user, perform any of the program's many functions. The Data Entry Window is where most of the data entry in CDK for Windows takes place. 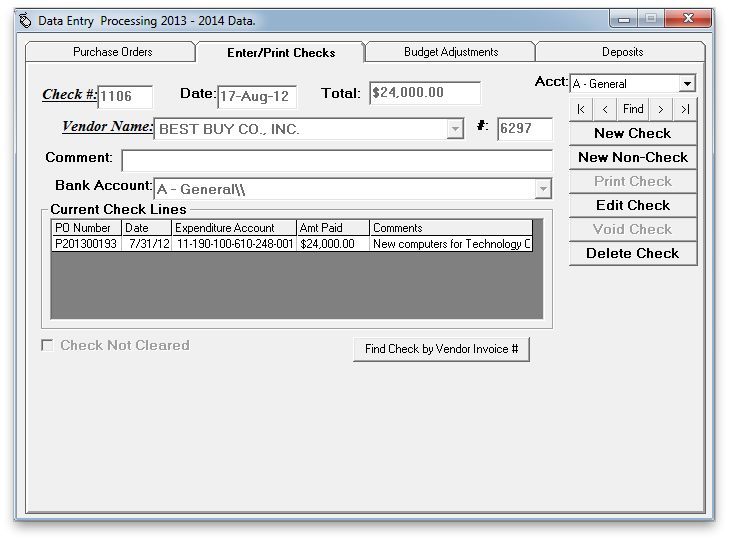 The Purchase Orders Tab is used to create, view, edit, and print purchase orders. 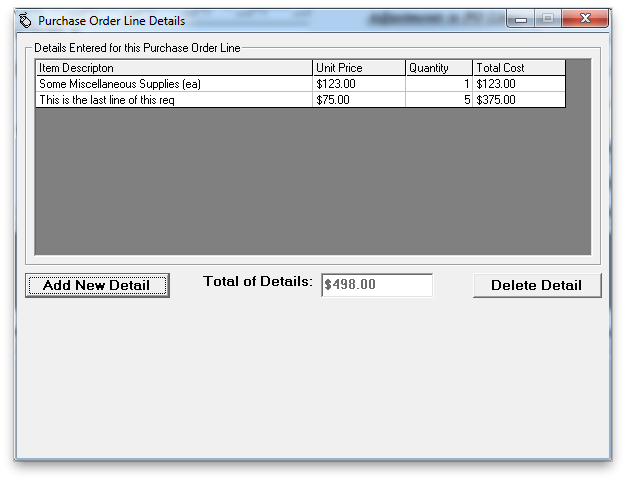 This Window is used to select which purchase orders are to be viewed in the Data Entry window. Purchase Orders can be selected based on vendor, year, payment status, or other factors. 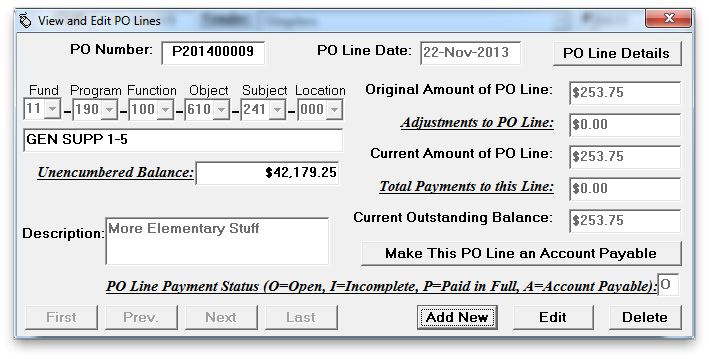 Hitting the "Edit PO Lines" button on the Data Entry Screen will display the "View and Edit PO Lines" Screen. 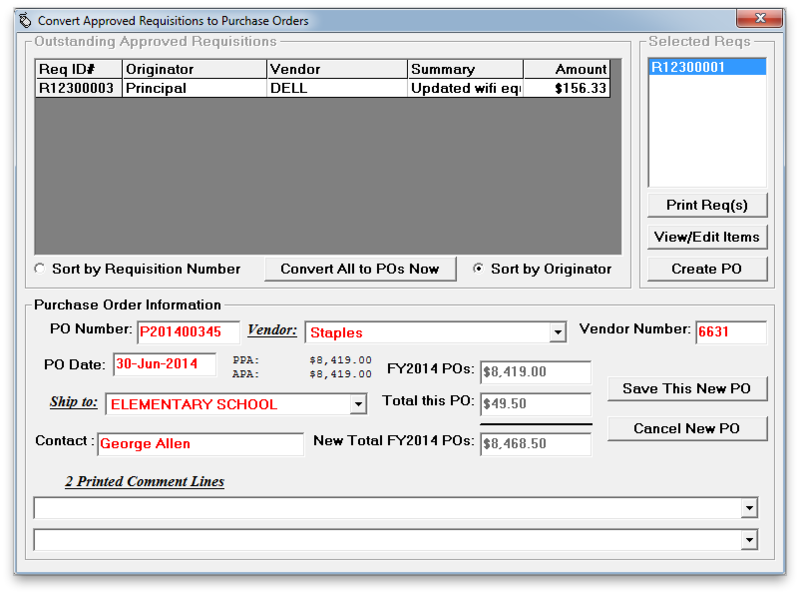 This screen provides more detailed information and allows you to edit, delete or add lines to the current purchase order. This Window is used for adding details to purchase order lines. The system automatically calculates the total of the line details, and sets the amount of the purchase order line to that total. 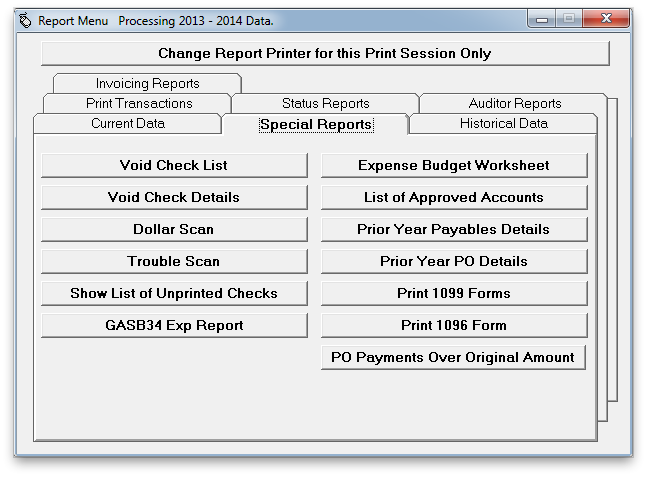 The Check Tab in the Data Entry window is used to create, view, edit, and print checks and non-checks. Unpaid purchase orders can be displayed and paid from this tab. Checks can be written against purchase orders, balance sheet accounts, or a combination of both. 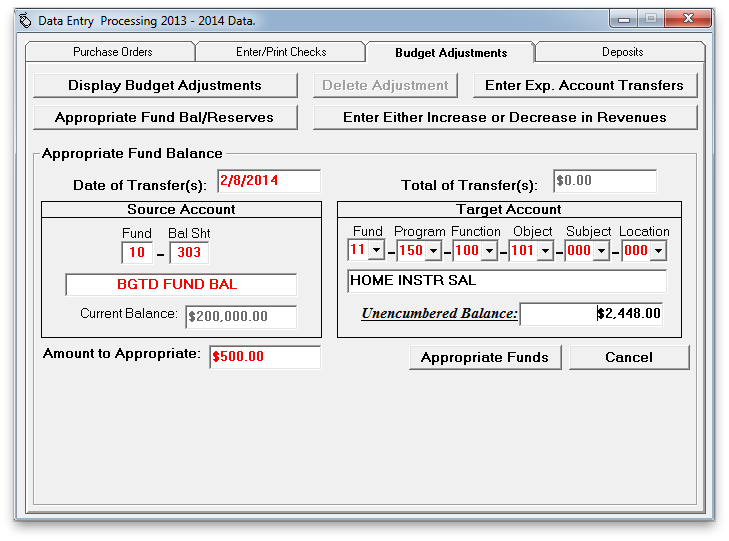 The Budget Adjustment Tab in the Data Entry window is used to enter budget adjustments. Appropriations of fund balances, increase/decrease in revenues, and expenditure account transfers are all entered on this tab. 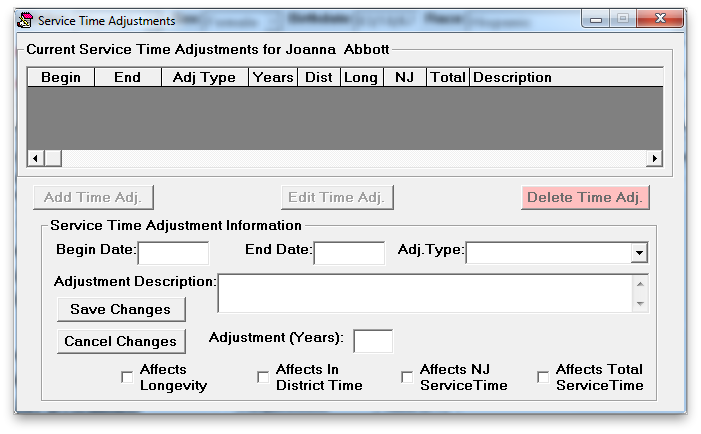 All budget adjustments in the system can be displayed, sorted by date, or only those affecting a certain expenditure or revenue account can be displayed at the user's request. This window is used to appropriate fund Balances/Reserves. All the required information is entered on this window. If you enter the target account first, the system will automatially select the correct fund for the source account. 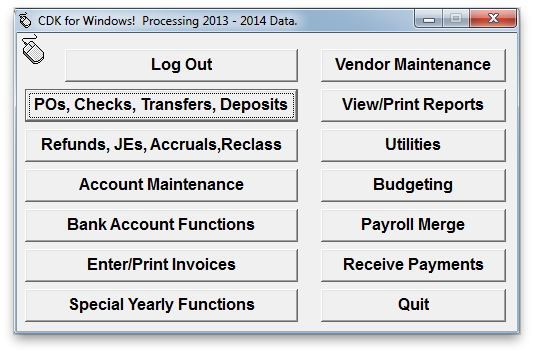 This Window is used for transfers between expenditure accounts. Transfers can be made from a single account to multiple accounts, from multiple accounts to a single account, or from multiple accounts to multiple accounts. This window is used to enter increases and decreases in revenue. 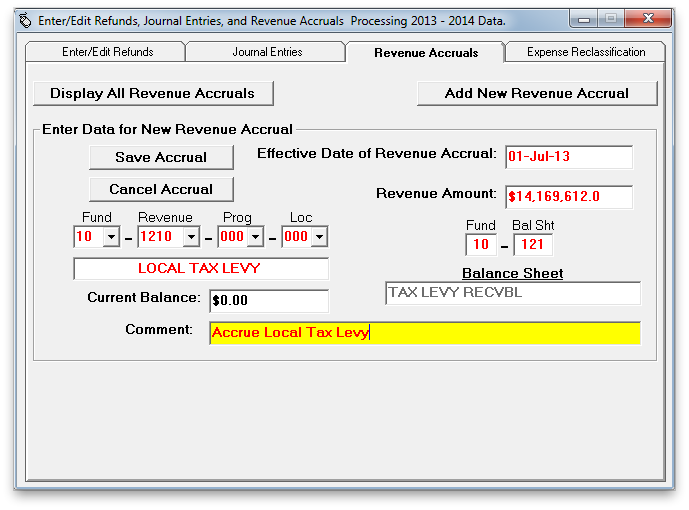 The revenue source account that is being adjusted and the expenditure account that is effected by the adjustment and the amount of the adjustment are entered in this screen. 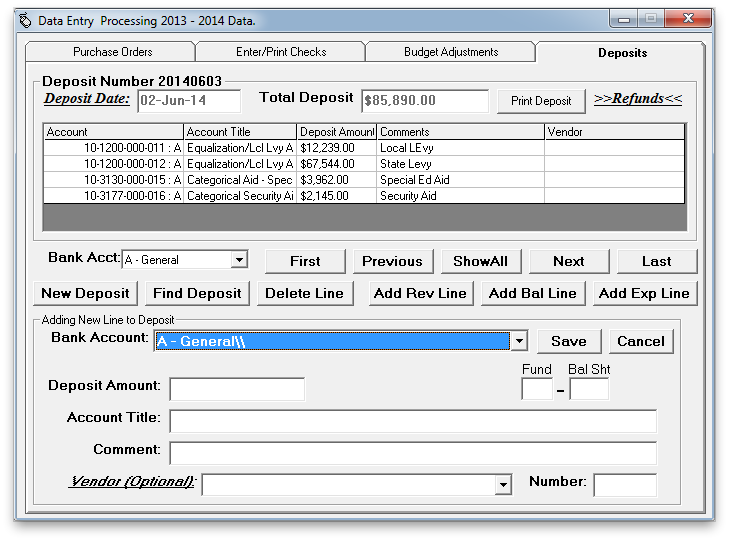 The deposit tab in the data entry window is used to record all deposits. There is no limit to the number of line items that can be included on a single deposit. 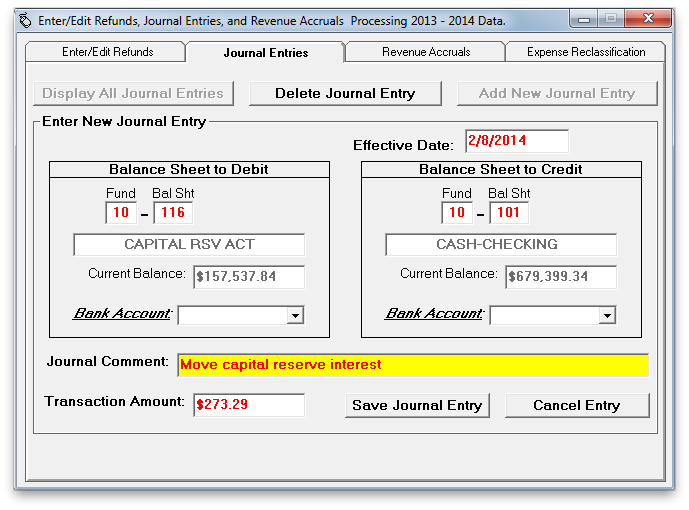 The Budget Entry screen provides an extremely user-friendly method of entering expense and revenue budgets as well as entering/modifying balance sheet opening entries. Simply double-click on any original budget or opening entry amount and then enter the new value. 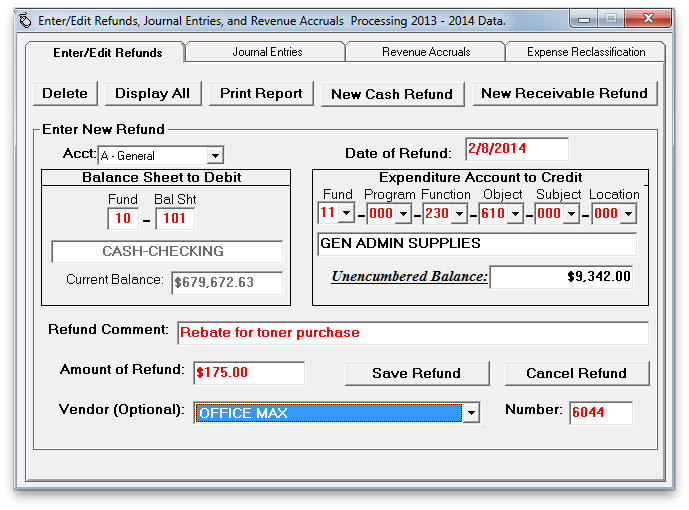 This window is used to create cash or receivable refunds. Refunds can be viewed and deleted from this window as well. This window is used to create journal entries. Journal entries can also be viewed and deleted from this window. The payroll merge function of CDK will allow you to import your payroll data directly from your payroll company's data files or from a data disk provided by your payroll company for this purpose. 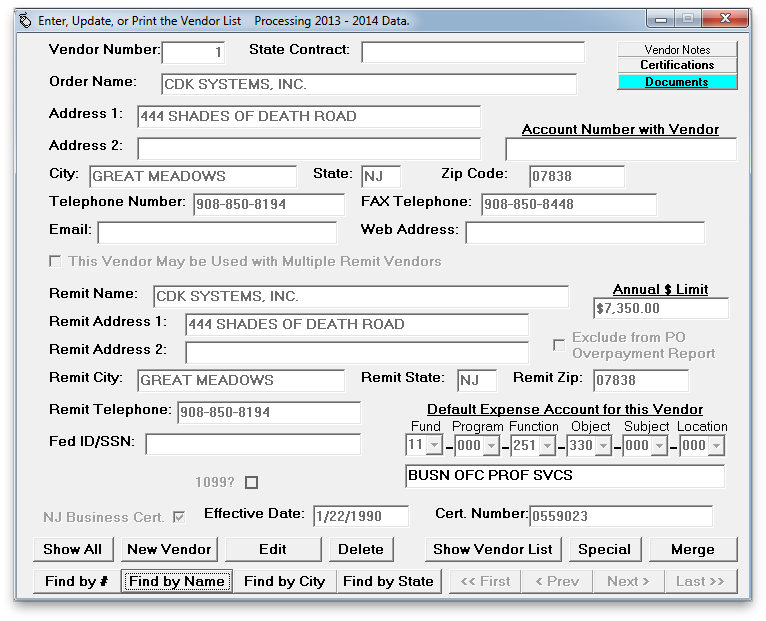 When using the payroll merge function, the check or non-check expenditure will automatically entered into the system. The system can automatically adjust any line in your payroll purchase order that is not sufficiently encumbered for the current payment. This window is used to create reveune accruals. Accruals can also be viewed and deleted from this window. This window is used to reclassify expenditures. 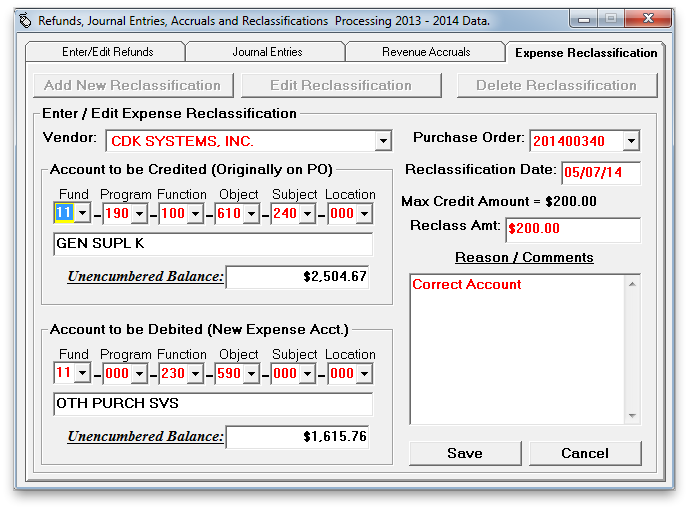 Expense reclassifications can be viewed and deleted from this window as well. 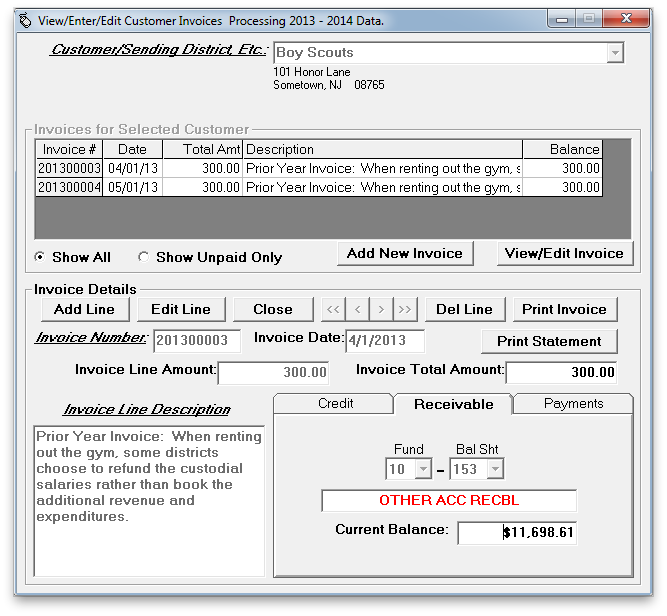 This window is used to create, edit, view, print, and delete invoices. You can view the payments made against the invoice, including the date and check number, on a tab at the bottom of the window. 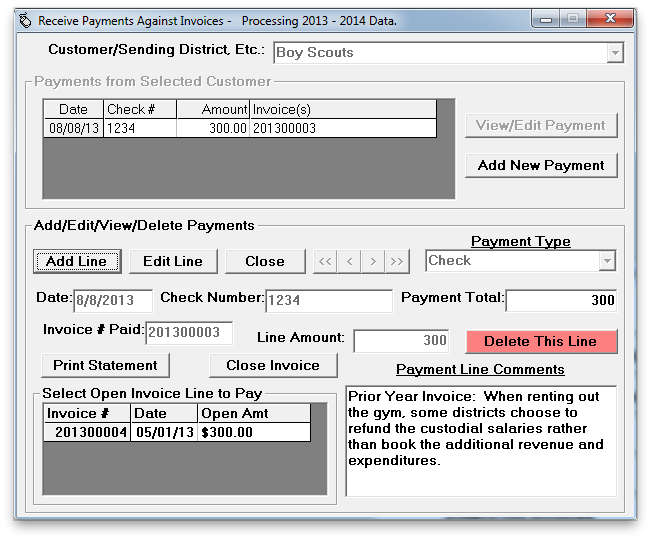 This function is used to receive payments agains invoices. When you receive payments, the receivable is cleared and funds received are placed in "Cash on Hand" (Balance Sheet 102). When receiving payments against invoices, the system will warn you if the payment date is earlier than the invoice date and offer to change the invoice date. The Vendor screen allows all information to be added about the vendors. This information is used for the printing of Purchase Orders and Checks as well as for recording the source of cash receipts. 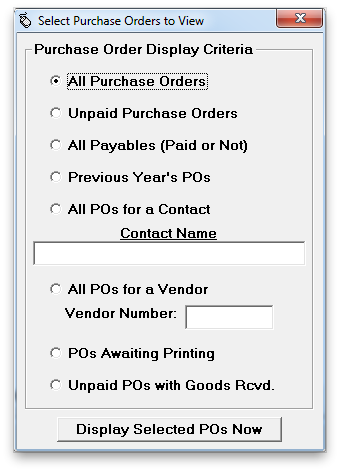 A list of all vendors sorted either by Ordering Name or Vendor Number can be printed from the Vendor screen. 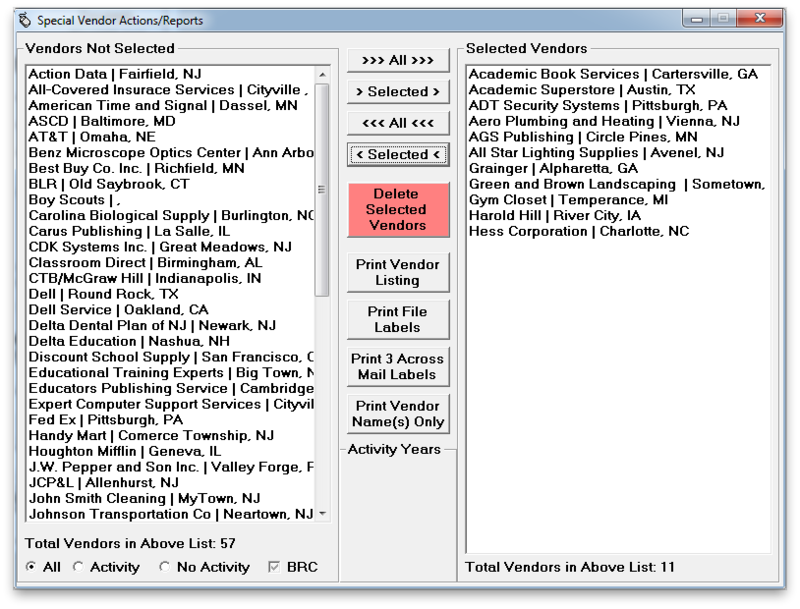 The Special Vendor Actions window is accesed from the Vendor window, and can be used to delete large numbers of vendors as well as to print mailing labels and file labels. 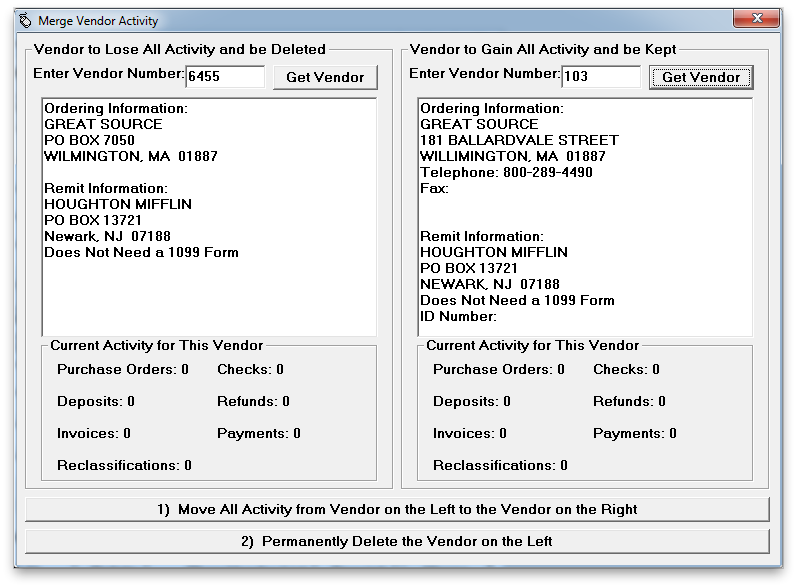 Using this window, duplicate vendors in the vendor list can be merged into one vendor with all of the activity that was recorded for each of the original duplicate vendors. 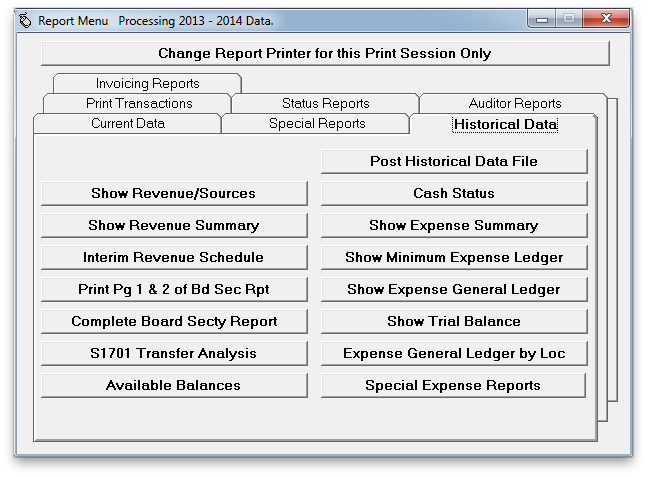 When entering the "View and Print Reports" screen, the "Current Data" tab contains reports that can be printed reflecting the current status of accounts. All of the transactions (purchase orders, checks, deposits, etc.) are posted to the current data file as they are entered. 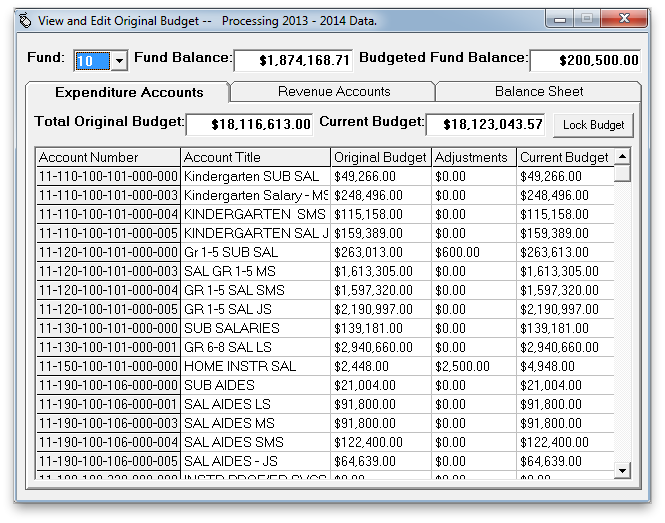 The CDK for Windows user may at any time view the reports on the current data tab to instantly see the districts current financial status. The "Special Reports" tab contains various reports that are infrequently run but are useful for finding a particular piece of data, checking for overexpended accounts, finding improperly entered data, etc. The "Historical Data" tab provides the ability to post the districts data to some date in the past (usually the end of the previous month) and print a complete board secretary's report or any of its components as well as some reports with additional levels of detail. The "Print Transactions" tab allows the CDK for Windows user to print lists of virtually any type of transactions that have been entered into the system. Most of these lists are selectable by date. Some are also selectable by status (such as PO status). Many options have been added to these reports to meet the needs/wishes of all of our users. The "Status Reports" tab provides detailed status of expenditure, revenue and balance sheet accounts as well as vendor histories. 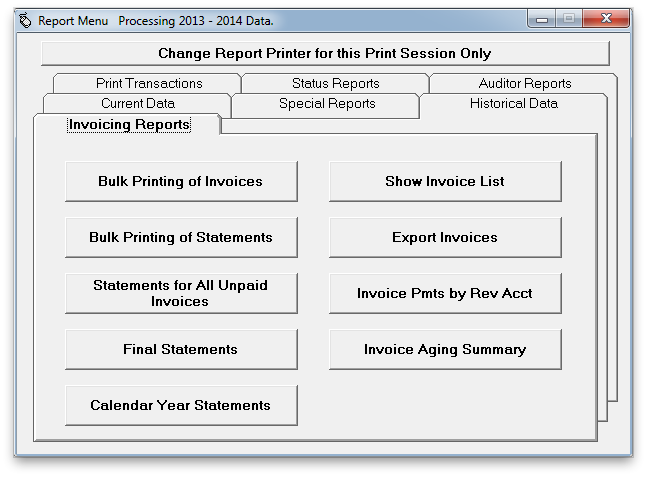 The "Invoicing Reports" tab allows you to view, print, and export invoices, as well as to view and print statements. 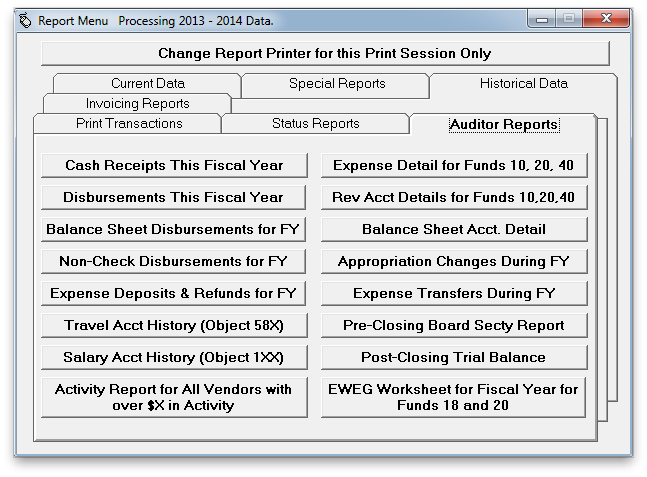 The "Auditor Reports" tab provides allows you to view and print various reports needed for auditing. Charter Schools will see an additional tab on the reports menu. 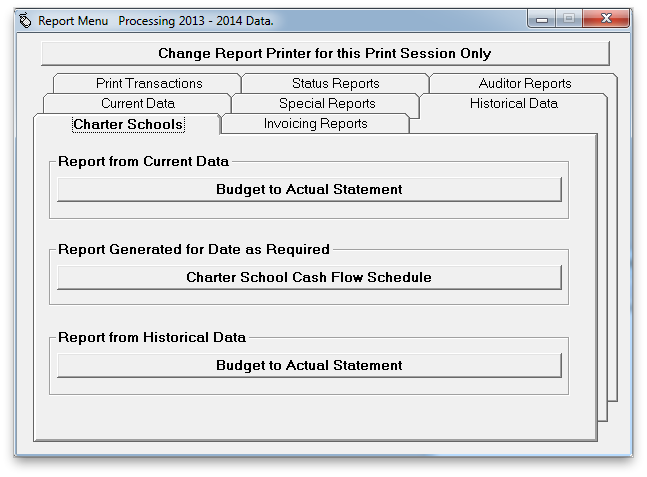 From the "Charter Schools" tab, they can print a 108 Line Budget to Actual report and the Cash Flow Forecast. 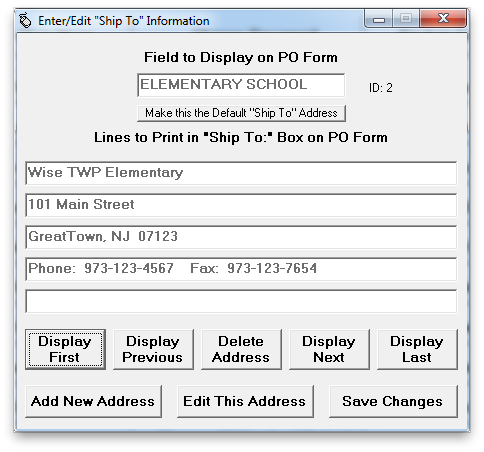 This window is used to enter and update the "Ship-to" addresses for use on Purchase Orders. This screen is used to create, edit, and delete user accounts, as well as to assign user permissions and reset passwords. This window is used to assign expense account permissions to resticted users. All restricted users have their own list of expense accounts that they are allowed to access. This window is used to export CDK data to an excel spreadsheet. 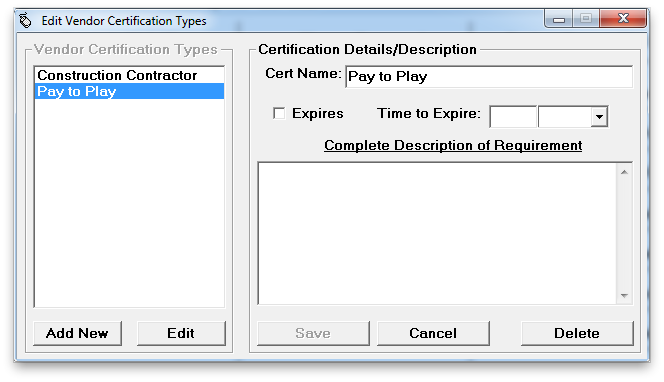 This window is used to create, view, edit, and delete vendor certifications. 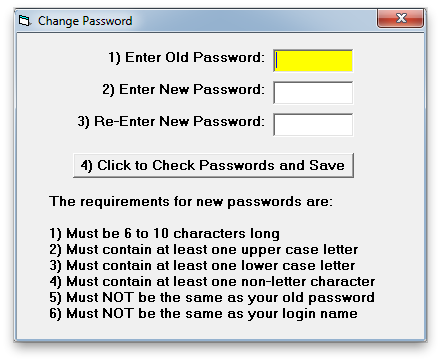 This Window allows users to change their passwords. 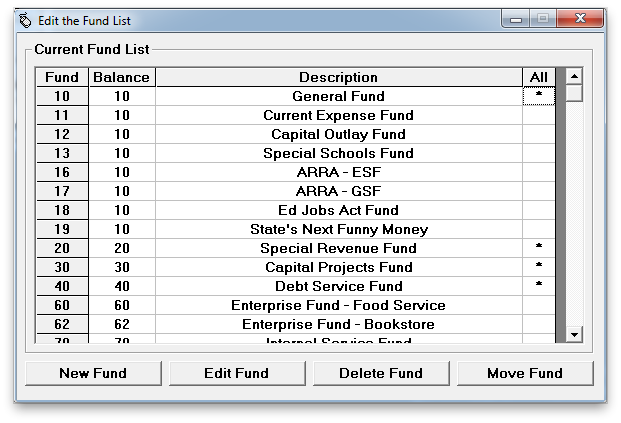 The Edit Fund List utility is used to add, change, delete, and move funds. 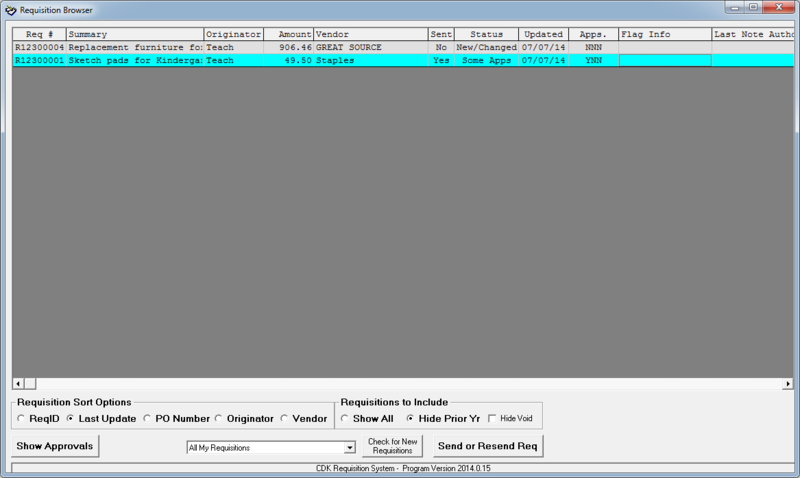 This window is also used to select which funds are included on certain reports. 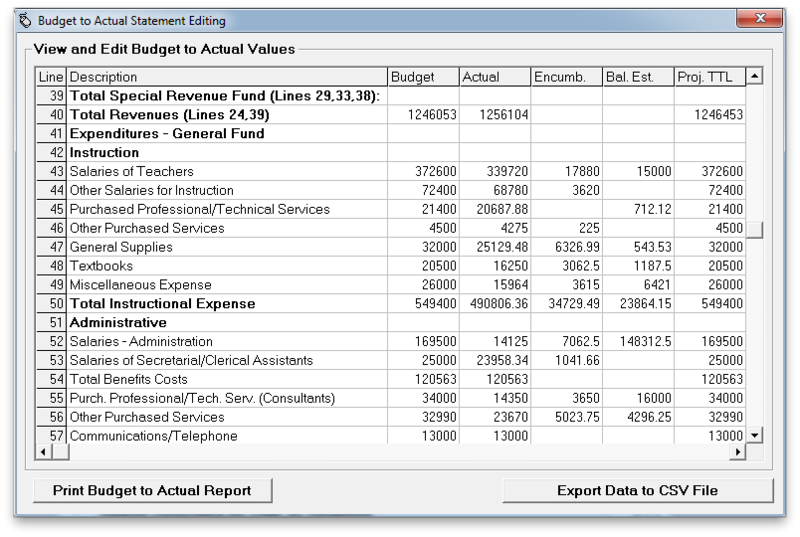 The "Budget to Actual" utility allows you to view and edit your budget to actual statement. 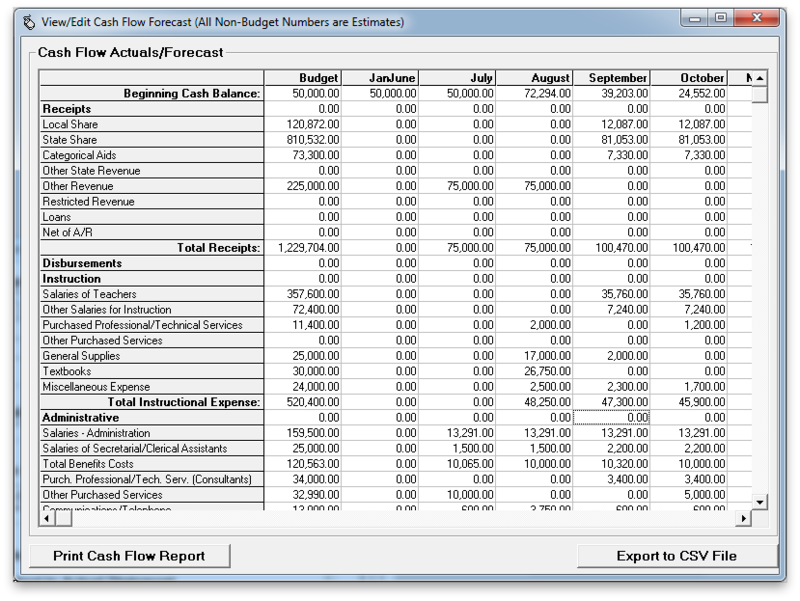 The "Cash Flow Schedule" utility allows you to view and edit your cash flow schedule. This report shows the percentage of the Original Budget transferred in or out. The report will show the remaining amount which may still be transferred without exceeding the 10% limit. Calculations reflect the limitation of transfers in as well as out. The available balances report will print the current available balances for all current expense funds or by everextended current expense funds. Users can select which funds and locations to run the report for. The information in the report includes the current expense fund, account title and available balance. The cash status report gives the current status of cash for a given balance sheet fund or for all funds combined. Cash account activity to date is summarized. The information presented includes the year opening cash balance, total receipts to date, total payments to date, and the current cash balance. The current cash balance is the broken down to show the current Capital Reserve deposits, long-term investments, short-term investments, and cash in checking. 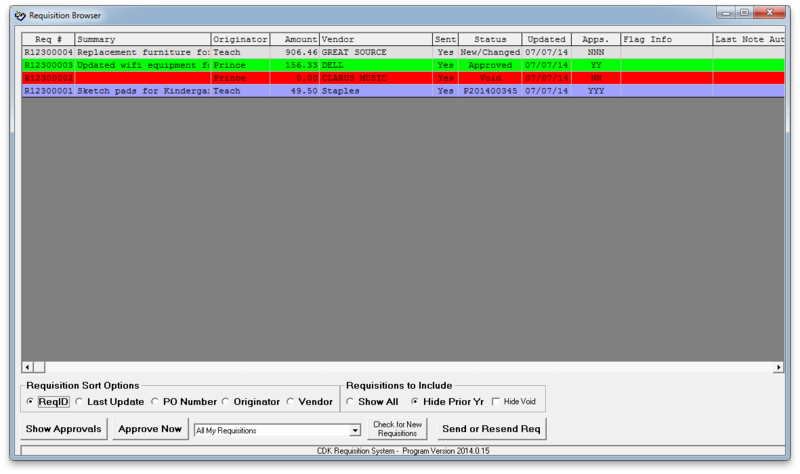 The show PO Lists report can be used to show a wide variety of PO lists. 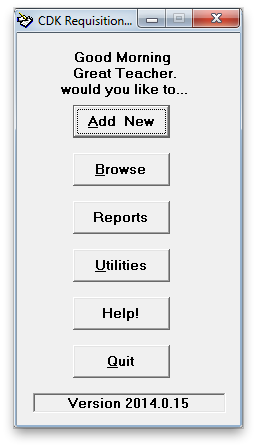 When you click on the report, another window sill open where you will chose the options for your report. You can choose whether or not to include Open and Incomplete POs, Paid POs, All Payables, or Unpaid Payable only. The report can also be limited by PO Date, PO Number, Contact, and PO Amount. This report shows a list of checks for a given period of time. You can select to print the check register for a single fund, or any number of funds. The check register lists all selected checks by date and check number. Alternately, the list can be printed and sorted by vendor ordering name. At the end of the report, there is a subtotal of all checks by fund, and a grand total of all checks for the period. 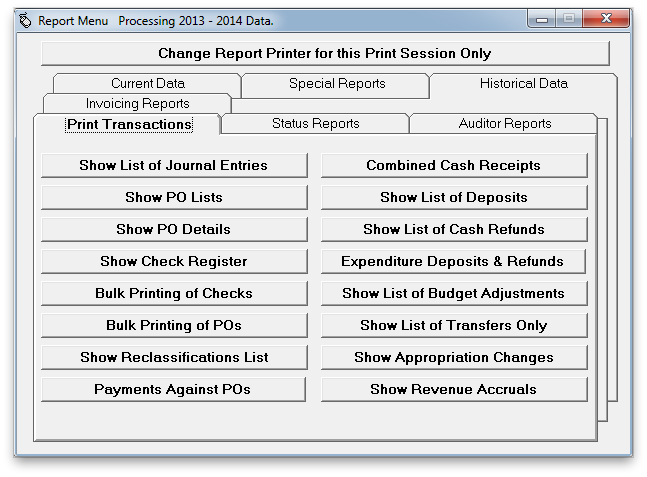 This report lists all cash receipts for any specified period of time for any or all funds. The information presented in this report includes date, deposit and/or account number, account title, amount, vendor name, and comments. All cash receipts are subtotaled by date. At the end of the report a subtotal is given for each balance sheet fund, and a grand total of all cash receipts. The list of budget adjustments provides a list of all transactions directly affecting the budget. This does not include the Original budget or prior year encumbrances. Included on the report are the date of adjustment, source account, target account, amount of adjustment, and comments. You will be prompted for a date range for included transactions, and whether or not to only include board-approved budget adjustments or not. The list of invoices provides a list of invoices for any or all vendors. You will have the option to choose if you want to only include invoices that are not paid in full, and whether or not you want each vendor on a separate page. The report shows the invoice number, Date, Ordering Name, Revenue account, Receivable, Line Amount, and Description. This Report shows a list of transactions directly affecting expenditure accounts that were reclassified. This report gives you the option to choose a date range. The report will show the Date, PO number effected, Ordering Name, Amount, and Reclassification Details and Comments. The single expenditure account detail shows beginning budget, changes to budget, and the current budget of the selected account. All PO lines and check lines are printed. The records are arranged so that the check lines are printed directly below the PO lie they are paying; all refunds to the expenditure account are shown last on the list. PO amounts, check amounts, and refunds are all totaled and the outstanding encumbrances and available balance are printed. The revenue account detail lists all transactions affecting the budget of the revenue account along with all deposited or accrued revenues for the account. Actual revenues are compared with budgeted revenues in order to show any amounts still expected or overages. 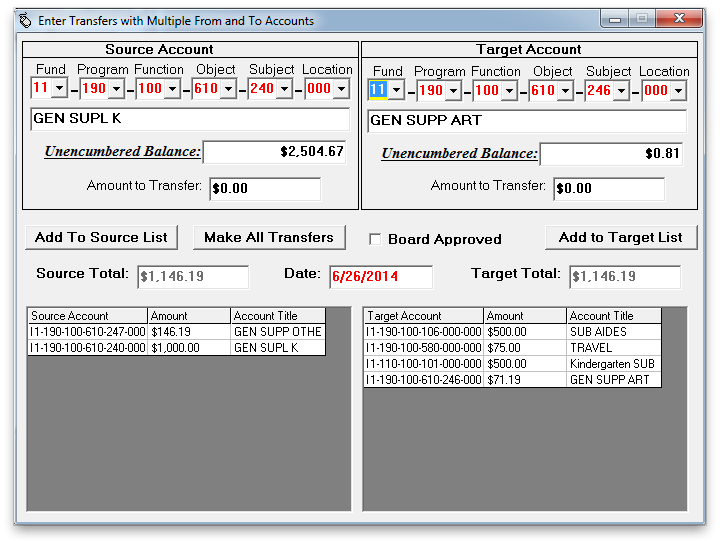 The balance sheet account detail shows all transactions that directly affect a balance sheet. 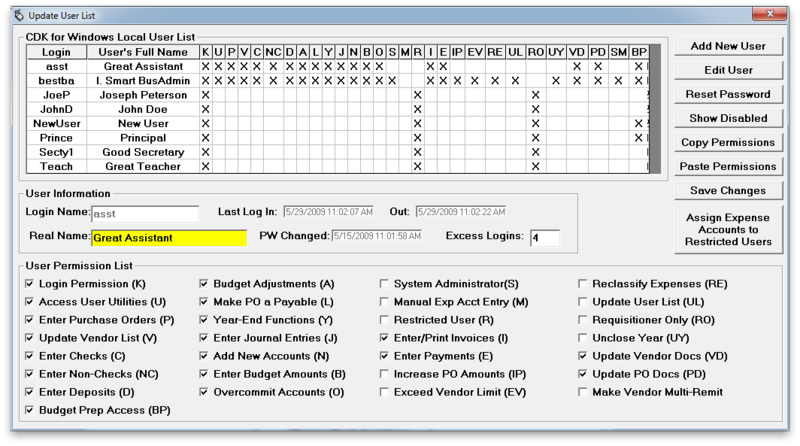 This report allows the user to select an amount, and then prints the activity for all vendors with activity totaling more than that amount. Specified vendors can be excluded (such as the payroll PO and Utility PO). The prior year payables details report will print out a detail report on all payables that were carried over from the previous year. You have an option to give an amount the payable must exceed in order to be included on the report or enter a zero to include all prior tear payables. This is a detail report on all encumbrances that were carried over from the previous year. You have the option to give an amount that the payable must exceed in order to be included on the report. This report will show any payments made in excess of the originally approved PO amount. The report includes all payments made within a selected date range. Specified vendors can be excluded from the report. You can include an approval signature line at the end of the report. 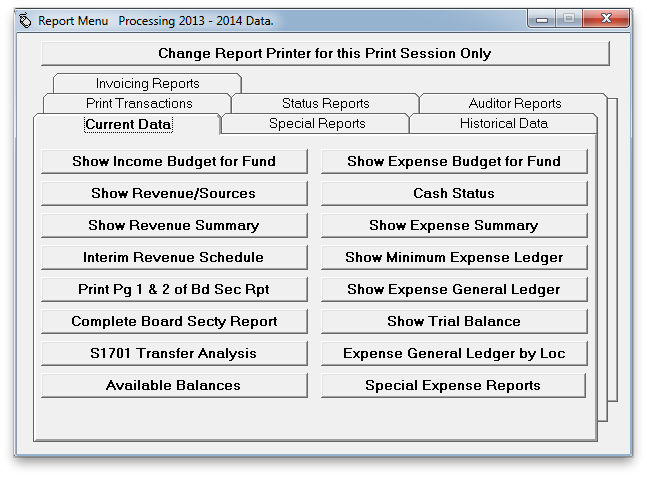 ​A Windows-based system for processing requisitions. Multi-User: It is designed to be used in a multi-user environment with each user being assigned a set of permissions appropriate to their position in the organization. Allows users to enter all requisition information including quantities, prices, description of items ordered, preferred vendor and expense accounts (if known and if assigned permission). Approval chain is completely tailorable to match organizational structure. Requisitions are tracked through approval process, and approval status is available to the requisitioner. 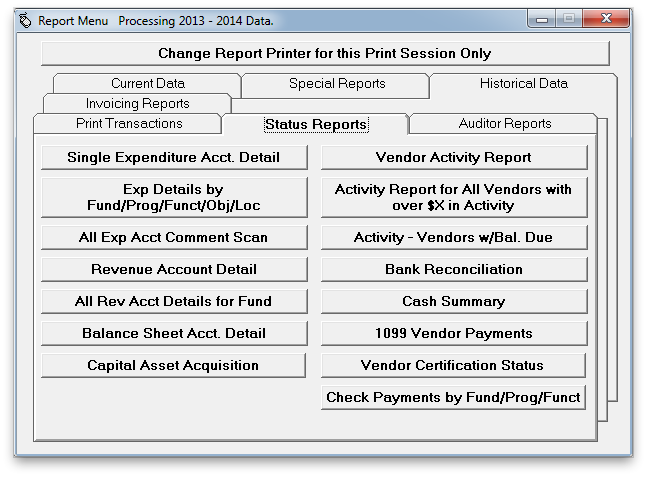 Completely integrated with CDK for Windows fund accounting software. When fully approved, requisitions can be converted to Purchase Orders at the business office without retyping information. Funds are not encumbered until requisition is converted to a Purchase Order. Users can access expense account status including available amounts before and after considering requisitions currently in approval cycle. Electronic copies of backup information, such as quotes, catalogue pages, etc., can be attached to the requisition and travel with the requisition through the approval chain to the business office. This is the main menu of the requisitioning program. Users can choose to create new requisitions, browse existing requisitions, view user-specific reports, and navigate to system utilities. By choosing the "Add New" from the main menu, users can create new requisitions. Users can select the shipping location, contact, date, and can write a summary of the requisition. Users then create the specific line items for the requisition. User can create specific lines for a requisition, choosing the account from which the use funds, the quantity of the item ordered, and the price, and can write a brief description of that line item. Once a user has created requisitions, they can view their status in the requisition browser. 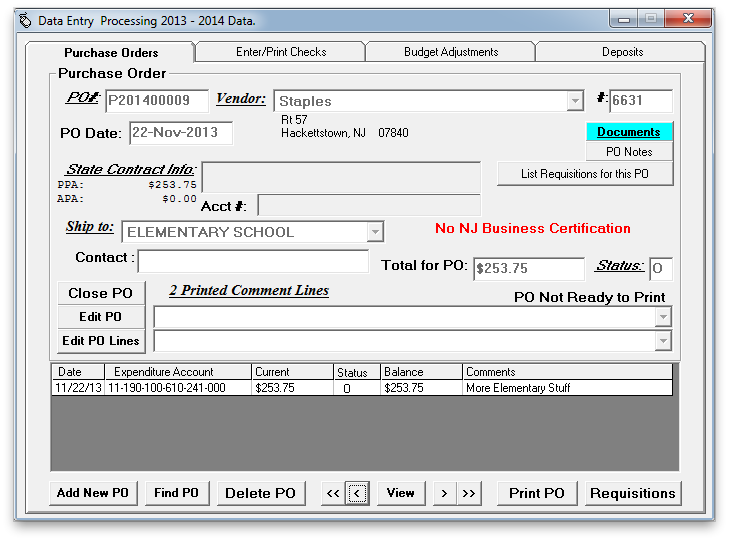 Requisitions will appear in different colors when they have been submitted, approved, and converted into purchase orders. 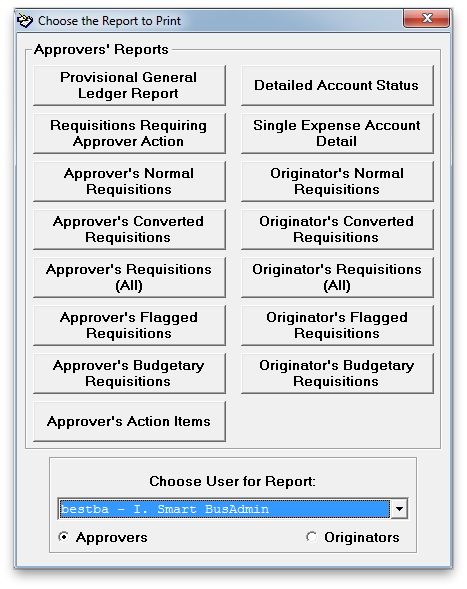 Users can generate various accounting reports and reports generated by the system summarizing their requisitioning activity. 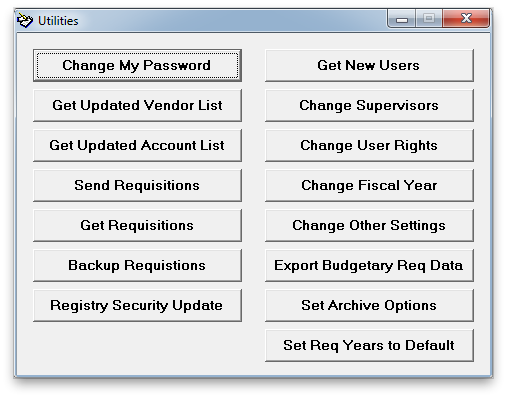 The user utilities menu allows a user to change their password, update system information, and backup their requisitioning data. For requisition approvers (principles, BAs, etc. ), the requisition browser includes the option of approving requisitions individually or in batches. Approvers' also have additional reports--they can view requisitioning reports for their own requisitions as well as for any users who they are responsible for approving. Approvers have additional options in the utilities menu as well. They can create new users, edit user permissions, change the fiscal year, and export budgetary requisitioning data in order to create the next year's budget. 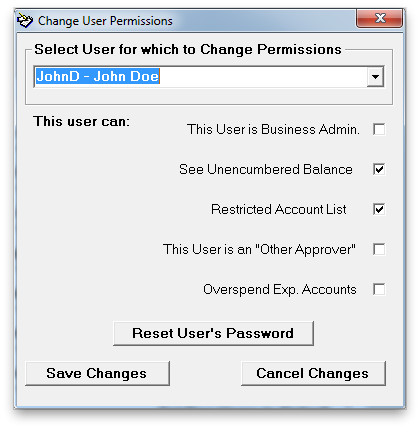 Approvers can set the user permissions for users whom they supervise. Users with the appropriate permissions can change the system settings including changing file paths for requisitioning data and setting various requirements for new requisitions. Once requisitions have been approved, they are sent to the CDK accounting software to be easily converted into purchase orders. All information added in the requisitioning system is automatically sent to the accounting system to be included on the purchase order. 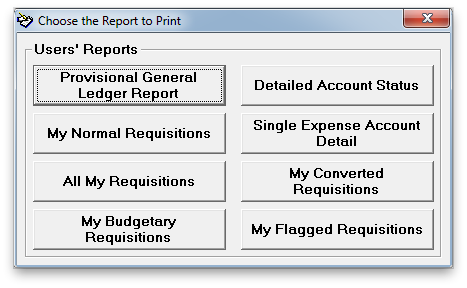 When a user chooses to print a requisition or view a report, it is converted into a pdf which will open in whatever system .pdf viewer they have installed on their computer. From their they can either save the file or print it using the system utility. Users can create a requisition price quote to be sent to a vendor. The provisional general ledger report shows details for every account, and displays any current requisitions under the account they would affect. If you are only interested in a single account, the "Single Expense Account Detail" report shows any account detail you choose along with all the associated requisitions. This reports shows all requisitions that have been converted into purchase orders. 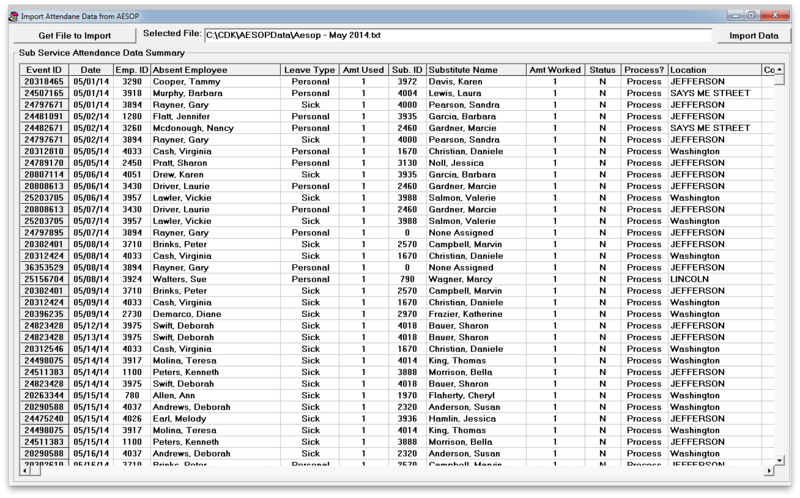 A Windows-based system for personnel tracking/recordkeeping. Maintains all employee records including education (degrees, continuing education courses, creditable on the job training), certifications, all contact information, salary, hourly rates and pay scale, hire tenure dates, health plans, user permissions. 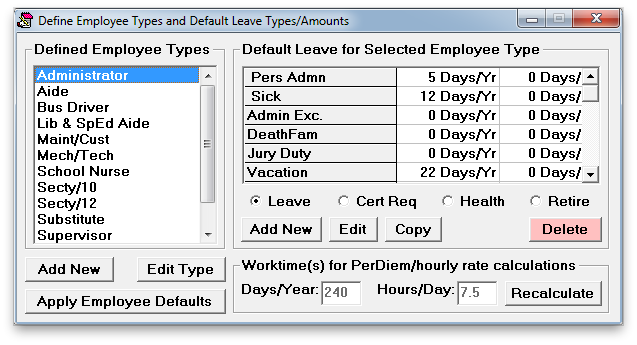 Complete leave tracking for personal days, vacation days and sick days as well as any number of user-defined leave types or reasons for absence. 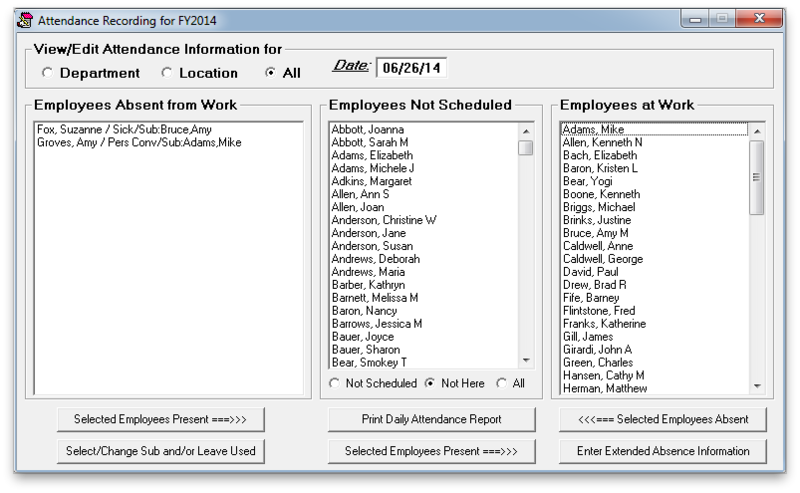 Tracking of employee attendance records. Tracking of required teacher professional development. 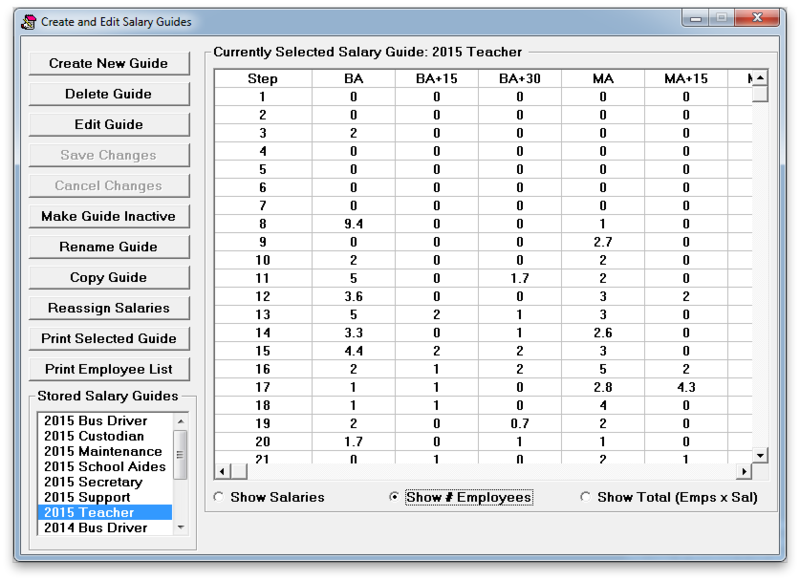 Entering and tracking of salary guides and calculating total cost of employees based upon various hypothetical pay scale scenarios. 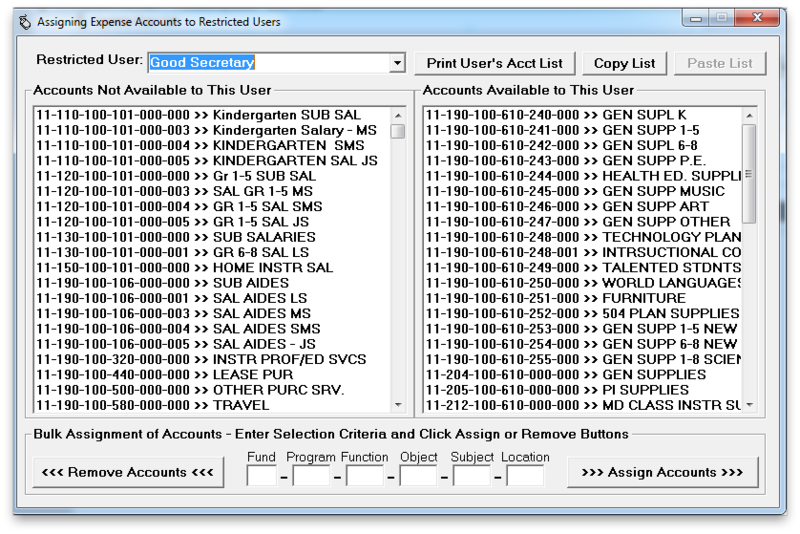 The Main Menu of the program, from which users can log in and access the other areas of the program. 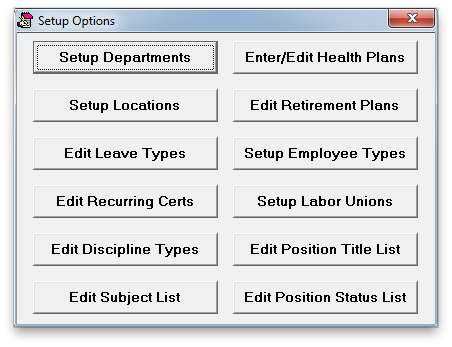 The Setup Options menu is used to access areas of the program where the user can setup/edit the district's departments, Locations, Leave Types, Recurring Certifications, Discipline Types, Health Plans, Retirement Plans, Employee Types, and Labor Unions. The Edit Leave Types area is used to create/define/edit the leave types used by the district, such as Personal, Maternity, Sick Day, etc. 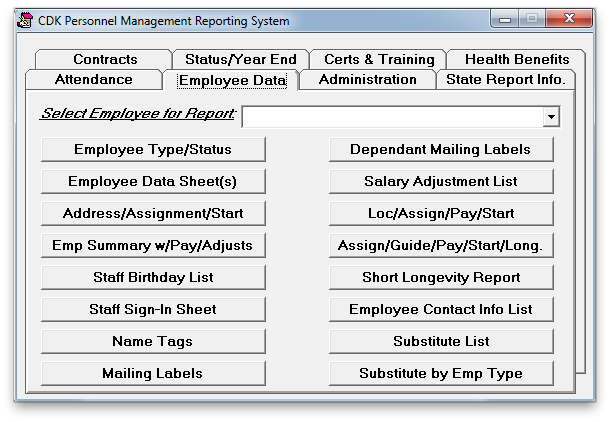 This section of the program is used to define/edit information about the various employee types. Information such as the certifications required, as well as the default leave amounts, and health and retirement plans for each employee type can be entered here. 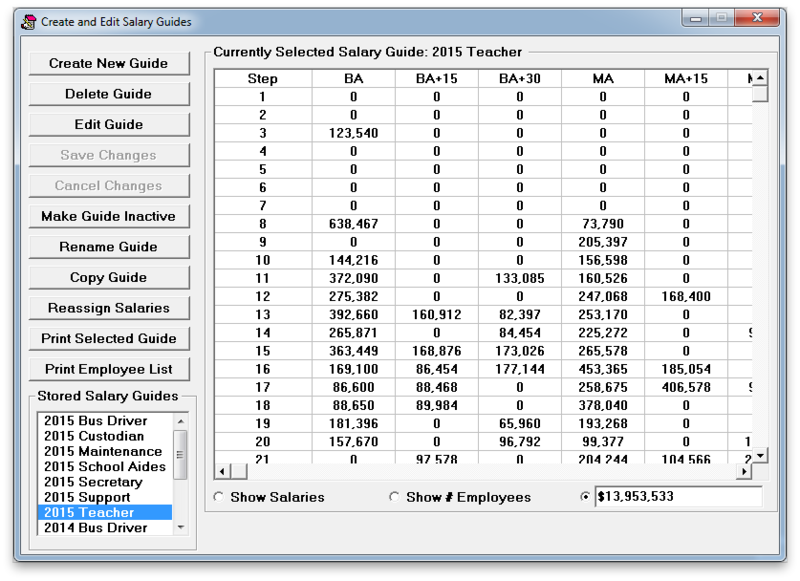 The system allows you to create and edit salary guides with any number of columns or steps. Guides can be created for annual salaries, per diem rates, or hourly rates. This screenshot shows a typical teachers' salary guide. With a click of an option button, we can quickly and easily show the number of employees currently on each step and column of the guide. One more click, and we can see the total salaries attibuted to each step of the guide based upon the employees assigned to that step. In the lower right you can see the total for the entire guide. You can also enter substitute pay information to determine the rate of pay for each substitute based upon the type of employee substituted for and the prior number of days worked. The rate can be expressed as a per diem rate or hourly rate. This information is used to calculate the payment due to each substitute utilized during any given month or pay period. 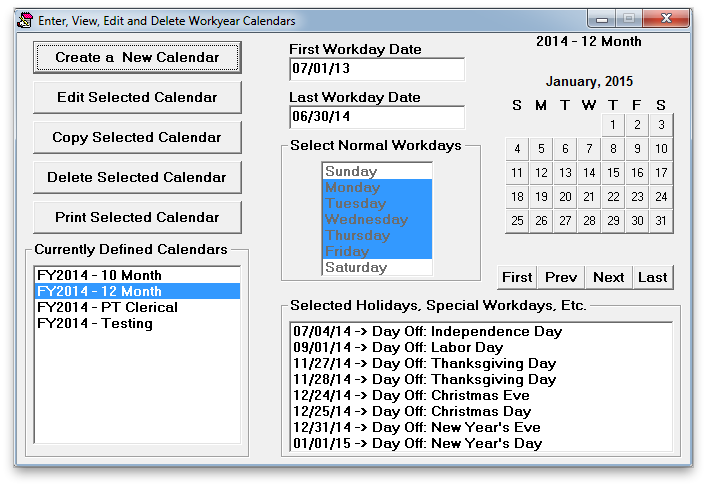 This area of the program can be used to create/edit workyear calandars, setting the start and end dates, the normal workdays, and special days such as holidays. The work calendars determine which days employees are expected to be at work for attendance purposes. This area of the program is used to create employees and edit employee information such as Personal information, contact information, certifications, employment info, attendance, benefits, salary, etc. This particular screen is used to edit contact information. 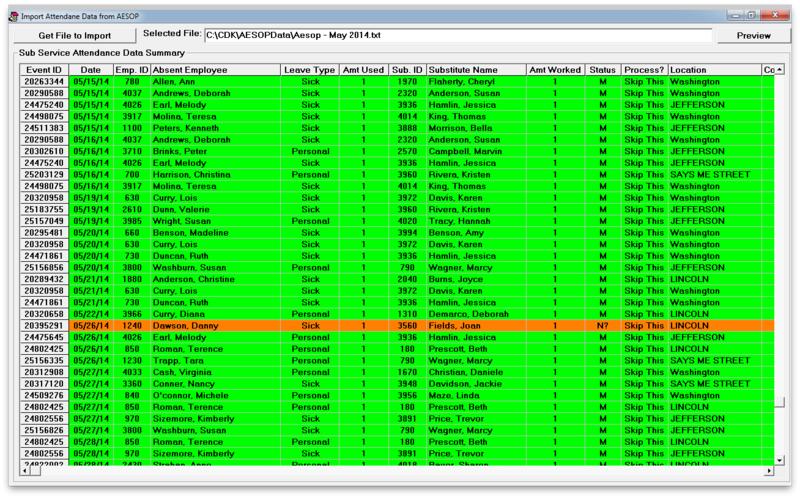 The employees shown can be narrowed down using the select subset of employees window. This tab is used to enter/edit employment information, such as full time or part time, schedule, position, department, service time, etc. 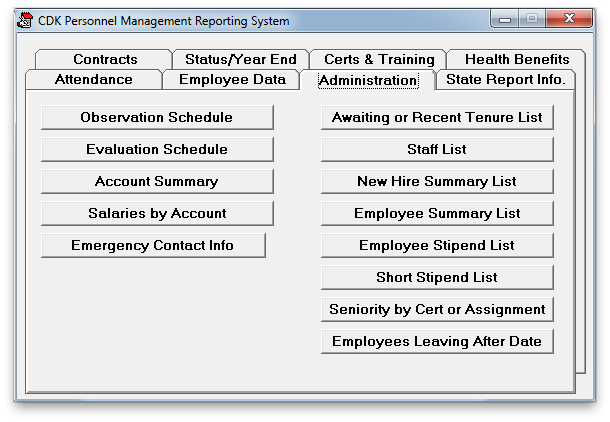 This screen is used to enter service time adjustments for employees. 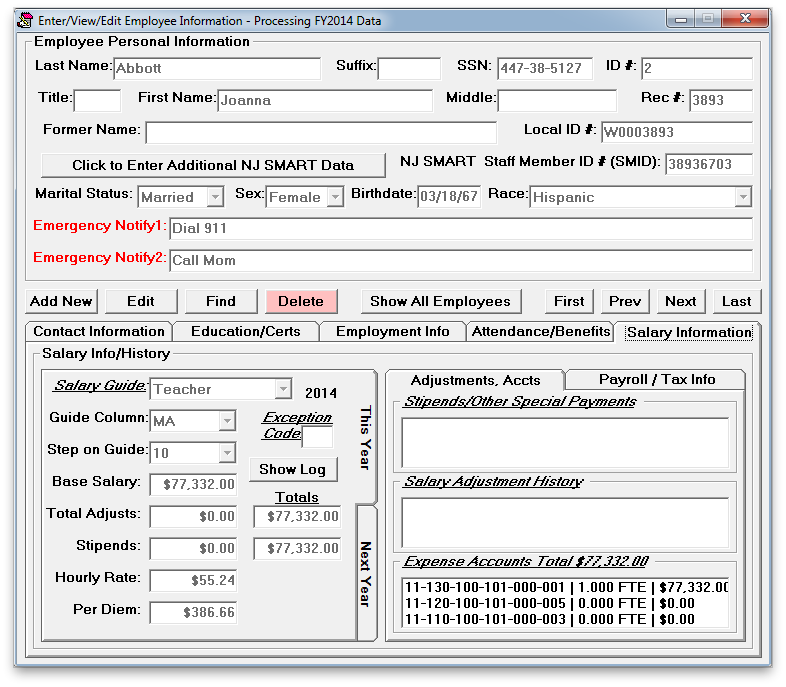 This tab is used to view/edit an employee's salary Information, such as salary guide and step, salary adjustments, etc. 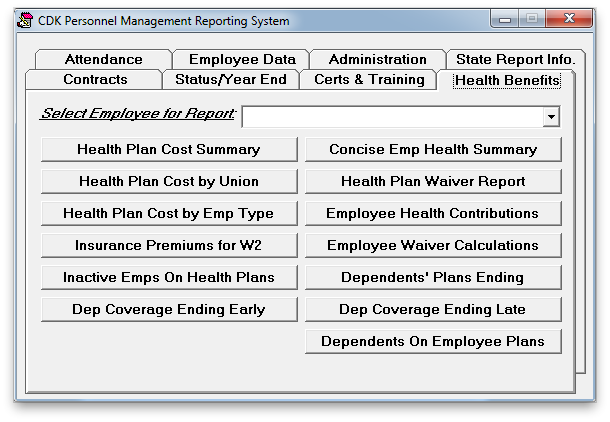 This screen is used to create and edit templates for employee contracts. 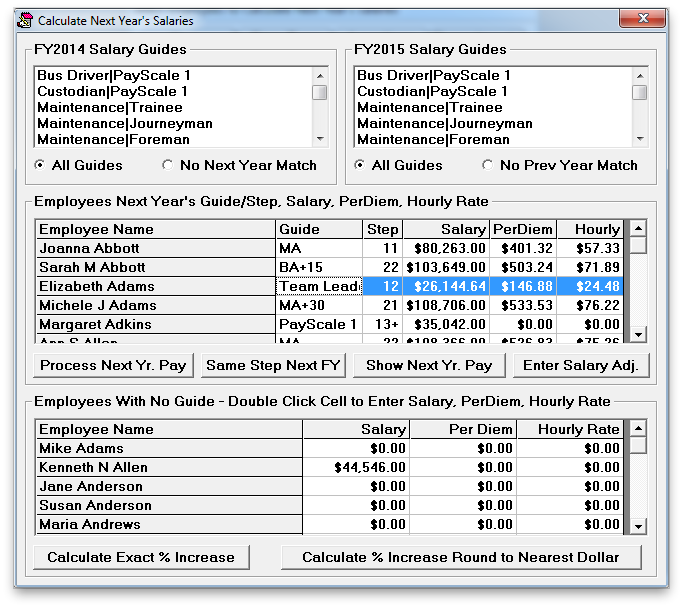 This screen is used to calculate employees salaries for the next year using the next year salary guide. For employees without a salary guide a percentage increase can be entered or individual salaries can be entered directly. 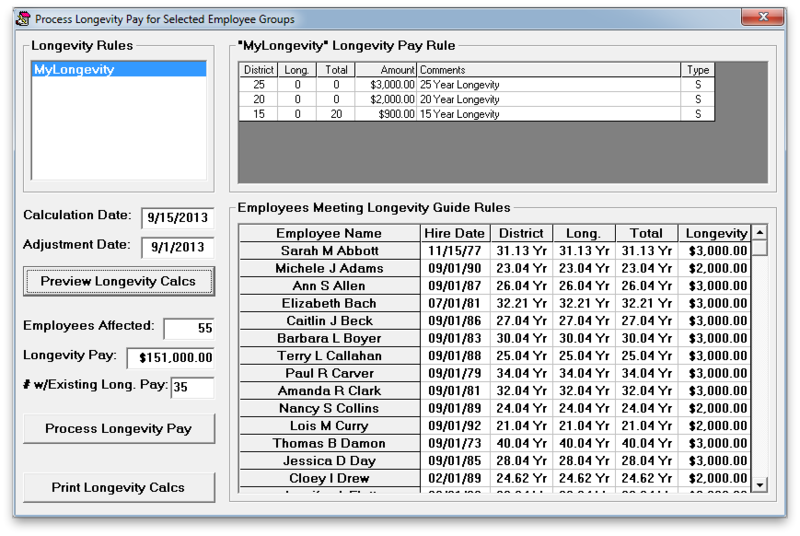 You can enter rules for longevity pay and then use them to determine the amount due to each employee and, if desired, automatically create the salary adjustment records. Daily attendance is recorded with a simple point-and-click interface. 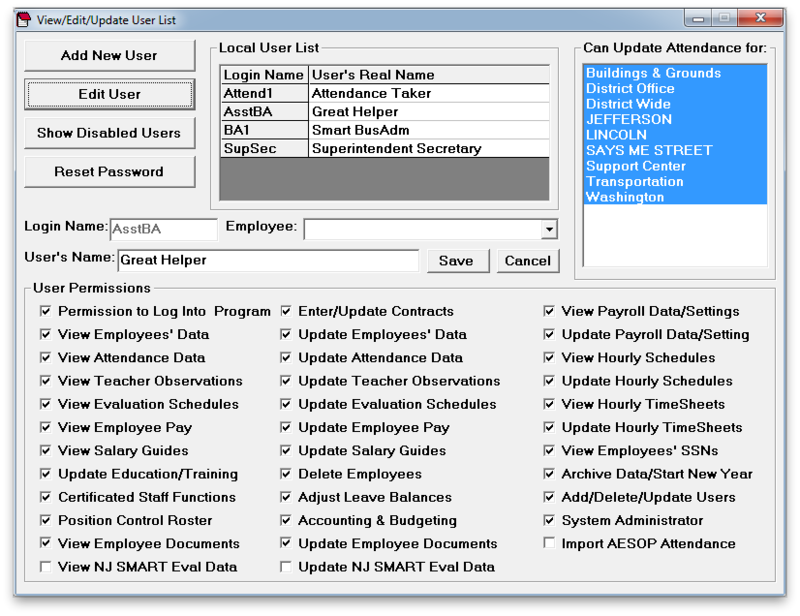 The system will display the employees expected to be at work based upon their assigned work calendar and allow you to click on the absent employees to record their absence and any leave and/or substitute information. 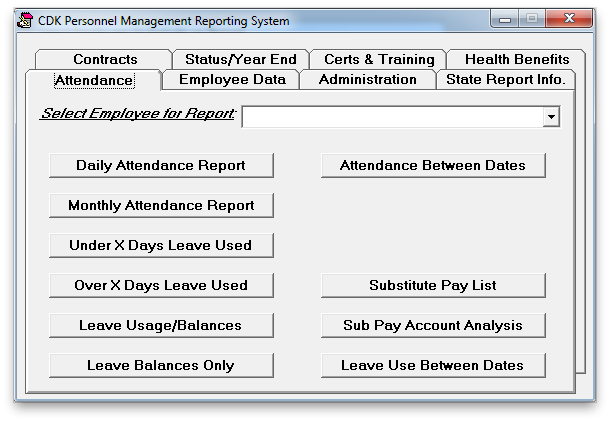 Once an employee is identified as absent, you are shown another simple point-and-click screen that displays leave balances and available substitutes and allows you to select these as appropriate. The program allows administrators to import data from the Aesop absence management system. Once Aesop data is imported the program color-codes the entries, allowing you to address any discrepancies between the data from Aesop and your local data. 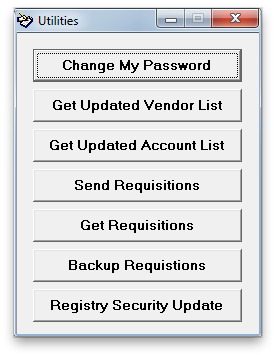 This screen is used to create/edit users, and assign user permissions. 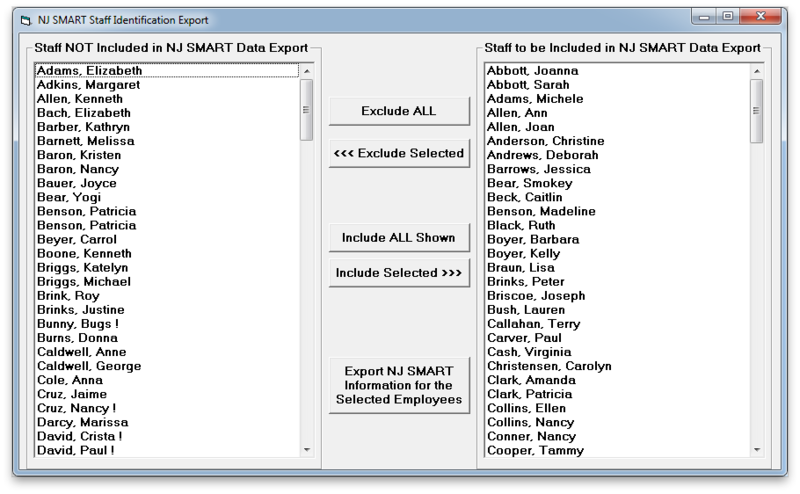 The NJSMART functions menu allows users to create files they need to upload to NJSMART. 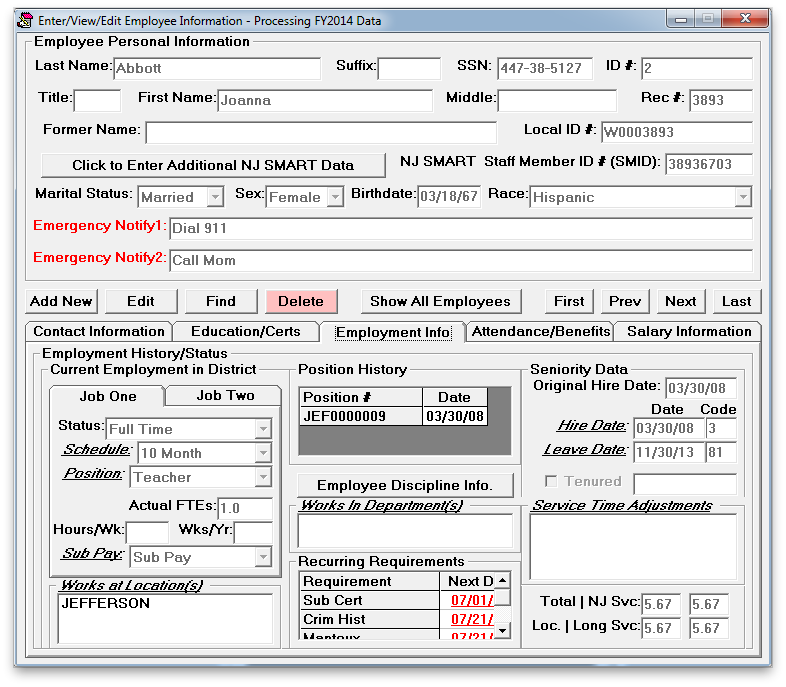 This form is used to select which employees to include in NJSMART submissions. 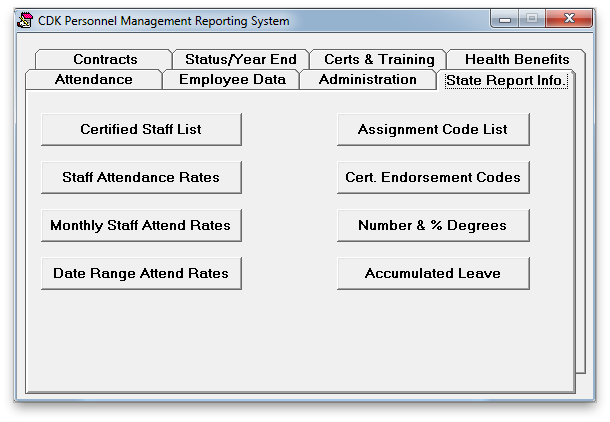 This area of the program is used to view and print reports including Attendance Reports, Employee Data, Administration Reports, Contracts, Etc. This tab is used to view/print attendance reports including Daily/Monthly attendance reports, Leave reports, and substitute pay reports. This tab is used to view/print employee dat reports including employee type, address, health insurance plan, salary adjustment, and other reports and mailing labels. This tab is used to view/print administration reports including eployee contact info, observation and evaluation schedules, stipend lists, name tags, etc. This tab is used to view/print reports including: certified staff list, staff attendance rates, monthly staff attendance rates, etc. This tab is used to view/print reports including staff development, training, certification, ad other reports. This tab is used to view and print health benefit reports. Description of Certified Staff List document. This report shows any employees who have used more than the specified number of leave days before a specified date. 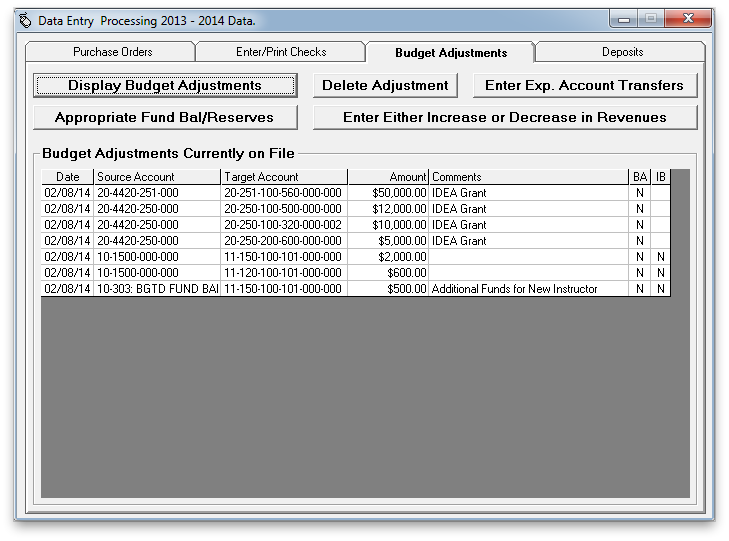 ​CDK Budget Prep software allows our users to quickly and efficiently develop their budgets for the coming fiscal year. The user-friendly point-and-click interface makes it easy to enter and edit the budget during the all-too-busy budget season. Its many time-saving features include importing the audited year’s and current year’s budgets from our CDK for Windows financial software and exporting the budget into the new year’s CDK for Windows database files. 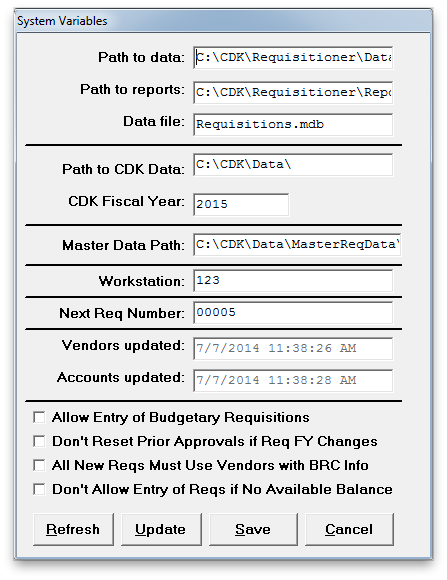 CDK Budget Prep integrates with our Personnel System to easily build a significant portion of the district’s salary budget based upon the proposed year salary guides and the anticipated guide/step occupancy. Budget Prep can also import budgetary requisitions from our electronic Requisition System to provide details for the supplies portion of the budget. The ability to import and export the budgets saves the user many hours of double and triple data entry and minimizes mistakes. 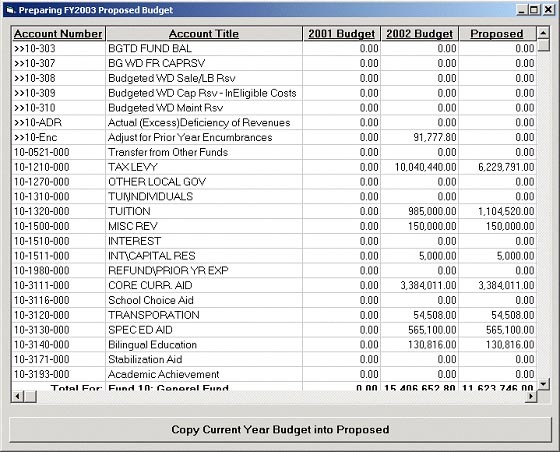 The revenue budget is displayed and edited in the same simple point-and-click environment at the expense budget. "No question is left unanswered. Everyone is always so helpful and very patient with my questions or helping me to understand what I did wrong and..."